Steely Resolve (Ex): Your supreme dedication and intense focus allow you to temporarily set aside the pain and hindering effects of injuries. When an opponent strikes you, the injury does not immediately affect you. You have a delayed damage pool that allows you to forestall the effects of many injuries. This pool begins at 0 with each encounter. When you are attacked, any hit point damage the blow deals is added to your delayed damage pool. At the end of your next turn, you take damage equal to the total stored in your delayed damage pool, which then resets to 0. Any healing you receive can either increase your current hit point total as normal or reduce the total damage in your delayed damage pool. When you receive healing, you choose whether it affects your damage pool, your hit points, or both (you can split the amount of healing as you wish). Most crusaders opt to keep as much damage in their delayed damage pool as possible to maximize the benefit of their furious counterstrike ability (see below). Damage reduction does not apply to the damage that is received from Steely Resolve. Special effects tied to an attack, such as energy drain, stun, and so forth, still affect you as normal, and their effects are not delayed by this ability. For example, if you are bitten by a venomous spider, you must still attempt a Fortitude save against the poison immediately, even though the bite damage shifts into your delayed damage pool. By the same token, any other special attack that imposes a condition, such as a medusa’s petrifying gaze, takes immediate effect on you. At 1st level, your delayed damage pool can hold up to 5 points of damage. Any damage beyond that comes off your hit points as normal. The maximum damage your pool holds increases by 5 at 4th, 8th, 12th, 16th, and 20th level. Furious Counterstrike (Ex): You can channel the pain of your injuries into a boiling rage that lets you lash out at your enemies with renewed vigor and power. Each attack that strikes you only pushes you onward to greater glory. During your turn, you gain a bonus on attack rolls and damage rolls equal to the current value of your delayed damage pool (see steely resolve, above) divided by 5, and rounding down (minimum +1). You can only gain a maximum bonus on attack rolls and damage rolls of +6 from furious counterstrike. Use the table below to quickly determine the attack bonus and damage bonus from furious counterstrike, based on the amount of damage in your delayed damage pool. This ability’s benefits last until the end of your turn. Backpack (2 gp, 2 lbs. ); Bedroll (1 sp, 5 lbs. ); scrollcase (1 gp, 1/2 lb. ); Flint and Steel (1 gp); beltpouch (1 gp, 1/2 lb. ); 4 days trail rations (2 gp, 4 lbs. ); 50' silk rope (10 gp, 5 lbs. ); sack (1 sp, 1/2 lb. ); sewing needle (5 sp); 2 waterskins (2 gp, 8 lbs. ); whetstone (2 cp, 1 lb.). Crusader's Strike Strike—Successful attack allows you to heal 1d6 + 1/initiator level. Vanguard Strike Strike—Allies gain +4 bonus on attacks against target. Charging Minotaur Strike—Charging bull rush deals damage, ignores attacks of opportunity. Stone Bones Strike—Gain DR 5/adamantine. Douse the Flames Strike—Target cannot make attacks of opportunity for 1 round. Iron Guard's Glare Stance—Enemies take –4 penalty on attacks against your allies. Vivianne stands 5'4 with waist length hair the color of sunlit honey and large golden brown eyes eyes. She favors simple styles of clothing under her armor in shades of rich blue or rich green that set off her tan skin and golden hair. Her build is well formed but on the slender side, the heavy armor does little to mask the curves hidden under it though. While she has a few scars here and there from a lifetime of minor accidents and training cuts, she doesn't have any obvious birthmarks or distinguishing marks. Vivianne is the quieter sister and when she speaks its generally in a polite tone, less commanding than her sister's. Mora (early fall) 21st. Parents home on Isle of the Mighty. Father: Jorden Caderyn, A hero of some note, Paladin and general holy servant, he traveled extensively with the girls when they were younger, showing them the world and teaching all he could to inquisitive young minds. Mother: Arianne, a celestial blooded human, her presence in the girls life was intermittent but dearly cherished, her final vanishing still weighs on Viviane, who wonders where the woman who gave her life is now. The parents were never married, thinking the bond of love shared more important than a physical symbol, Both may still be alive, her father certainly is, still in the family home on Isle of the mighty. Arianne however vanished when Viviane reached 14, her presence had been intermittent before then, long periods of time when she was away, doing who knew what though she spent as much time guiding her young daughters as possible. Yes: Bree Cadeyrn is her older sister, confidant and best friend. They are traveling together and many say they look quite similar, Bree's hair is a paler platinum blond as opposed to sunny honey blond, though. Due to the nature of their mother her family is unknown, any paternal grandparents have since passed on, and the father was an only child leaving him Vivianne's sole blood relative other than Bree. Wonderfully. Vivianne is welcome home at any time and she deeply loves, respects and adores her father. Her relationship with Bree is equally loving with the younger girl looking up to her older and more charismatic sister. No, though her father trained her in martial ways, reading, rights and wrongs and when her father's teachings didn't advance her any more she learned with her sister, trial and error teaching them many things and giving each girl a distinct style. Her father did most of her schooling while they traveled. Father, and to the same extent her sister. Books are interesting but people are more important. The choice between saving a soul and saving a book will ALWAYS end in the favor of the humanoid life, regardless of the book in question. Bree is her best friend, and always has been. Being that the family traveled a lot, her father taking jobs as a paladin and hero of the people and taking his girls with him to teach and protect them they never really got to close to anyone else. Bree is very much alive and well, as is her father. Life is all memories, there is no way to pick one moment of a lifetime of companionship to call the most memorable. Loyalty, honesty, dedication. Vivianne puts friends and family as some of the most important things in her life, to have that devotion not returned would hurt her greatly. Romantically, no she's never really been away from her family and duty long enough to fall in love and isn't really seeking such. She believes when its time for love to find her it will, as it did with her parents and looking for it early would simply distract her from other important things. Religion can be extremely powerful and while she has a lot of respect for religion her father's paladin nature didn't rub off on Vivianne. She is a good person and exemplifies much of what the good deities would look for in a follower but she believes in doing good before doing service to a god. When these two coincide its wonderful but she claims alliance to no deity. The afterlife is peace at the end of a long day, or torment for the torments visited upon others depending on whose afterlife is in discussion. The community and family feel of religion would draw her most. Spirits of nature and elements gain the same passing respect from Vivianne that everything else she doesn't truly think about often receive, the truly dead should be honored and missed and the dead that walk are generally a blight upon the face of Therafim, evil things to be removed before they harm others. Those that focus heavily on the darkness or evil in the world, condone tormenting the weak or harming the innocent. Her views on deities are very Paladin in what is acceptable and what isn't. Again her moral values bear striking resemblance to the code followed by Paladins. Duty, Honor, Right. Vivianne will kill in the defense of self or others or if the person/creature is irrevocably evil and offers her no option. Stealing is against the rules and thus to be avoided at all costs, as is deception, even in the cause of diplomacy a difficult truth in the end is more powerful than the most gilded of lies. Violence is something to resort to after trying to reason, magic is less important than its wielder, magic itself is a tool one that has no place in honorable combat unless its offered to both participants. Dealing with evil beings should be avoided, they try to twist one into their own image and misuse people. Extremely, Once her word is given Vivianne will work tirelessly at a goal unless it would risk the life of something she holds dear, her sister. Above and beyond all to Vivianne is Family. She would give everything, any hope of power, privilege, endure any pain to protect her father and her sister. Honor falls next, Her word is paramount. Power is only a means to protect those dear to her, something that she would do at any cost thus power ranks fairly high as well. Fame is more the ideal of her sister, though she would love to be remembered for the good done with her life. Friends, she has none but she will see them as family nearly, something to cherish and protect. Knowledge and religion are interesting but not all that important, nor is wealth. As often as anyone else, but she rarely remembers them. Magic is a tool, used for good or ill at the hands of mages and priests. The people who use it are just like everyone else, just with magic and are each judged on their own merit. Fearsome monsters offer a chance to protect others from facing them and don't particularly frighten her, similarly the unknown doesn't much bother her as she walks to face it with family at her side. Vivianne is a fair hand at cooking the meals while camping, otherwise she doesn't have many truly unusual skills or knacks and dresses in a simple, conservative style. Some might see the lack of deception as a flaw, or her rigid adherence to law.. she has no real secrets preferring to be honest if people dare to ask her questions. She is obsessed with her sister though, she will often see that her sister is cared for before she herself is. Not that she is aware of, she's lived a peaceful life thus far, really, and hasn't had a chance to make enemies. Family above all, Her father and her sister are the most loved things in her life, She's fond of fruit, puzzles and peace as well. Cruelty for the sake of itself, which she usually attempts to intervene in, those that break the laws and get away with it.. those she'd attempt to turn into the proper authorities if at all possible. Losing family, Seeing Bree's life end would be the thing that would haunt nightmares if she had them. She knows life is finite, that eventually her family will fade but she fears being alone in this world. Traveling with her father and sister Vivianne had a chance to see many nonhuman monsters but hasn't been actually exposed to fighting one yet, her skills are all gained from training, guidance in safe situations. 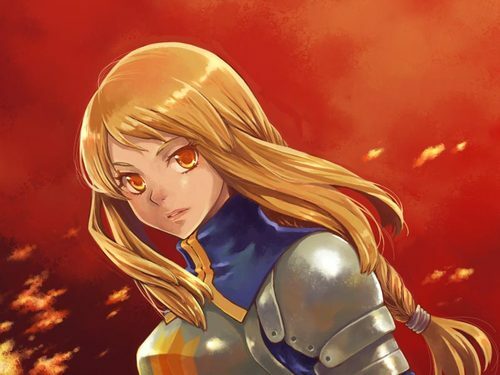 Vivianne was born into a happy family, A noble paladin as a father, an older sister she loves and adores and a mother she loved and now misses dearly. Most of her childhood was spent without her mother, in the company of her father and sister traveling the world on the adventures of a paladin. She learned at his knee the differences between right and wrong, to stand up for her beliefs and how to wield a weapon. 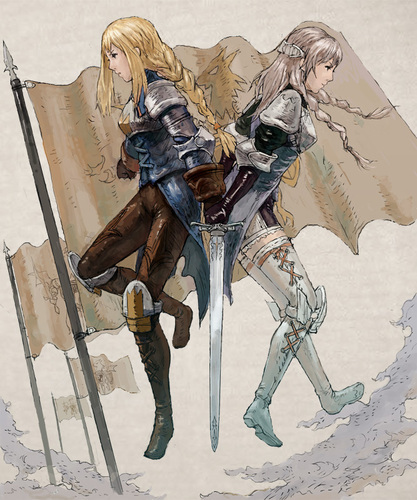 Once the basics of training had been given she and her sister, Bree, altered the basics between themselves, not wanting to follow in the exact same path as her father she adapted her stance, her techniques, often by trial and error to stand at her sisters side through everything. When she reached adulthood she and her sister decided it was time to leave the nest, bidding a fond farewell to the father she's ever so close to, the quiet young woman followed her sister to Avalon. The hope in the city of Bridges is to prove themselves, lend aid where they can and maybe.. just maybe find where their mother went. The last seems unlikly but blood is thicker than water, somehow they'll find a way.